I know, I know, it's another choux pastry! But what can I say? I need to clear out some of my bread flour as I discovered another 2 kilos of T55 lurking somewhere in the Hell's Kitchen, supposedly for croissant making! Tsk! Religiuese is French pastry made of two cream-filled choux, one larger than the other, buttercream or whipped cream is piped to join both puff to create a frilly collar or a ruffle to resemble a nun. A plump nun! Religiuese means nun in French. 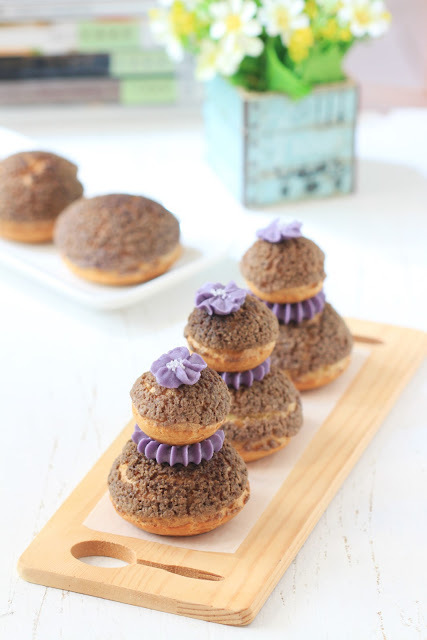 My take on the traditional French pastry, incorporating ube or purple yam, a popular tuber back home in Duterteland, to create these delightful East meets West pastry. Ube, for those who are uninitiated, is a tuberous root vegetable with vivid purple colour (some are not vivid at all) and widely use for desserts. Ask any Filipino what's their favourite ice cream or cake flavour and you'll get a chorus of "Ube", especially for those who are outside the country. Of course, I didn't use fresh ube here, only ube paste and powder, but you can find ube here in smoggy Hongkong! Just like most French pastry, Religiuese is made of several components, the choux, pastry cream, (French) buttercream and chocolate ganache. 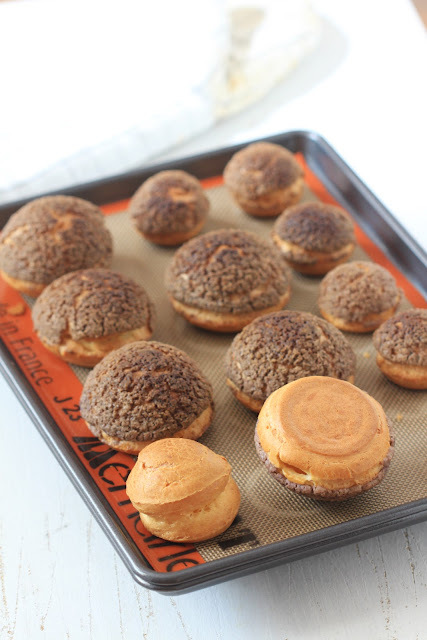 I used craquelin as a choux topping because I love the texture and not as messy as using the ganache. The craquelin though has lost its pretty colour along the way lol I don't want to sacrifice the texture of the choux (not crisp enough), just to get that very Instagramable purple colour, if I scale down the baking time. Okay, maybe if only I remember to tent the top of the choux after 30 minutes of baking..... Small oven problem! 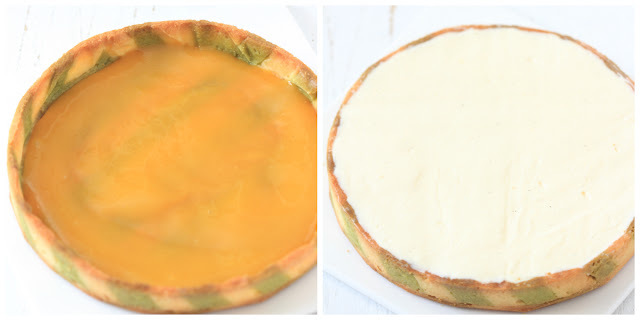 For the pastry cream filling, I only used half of the recipe listed below as I ran out of milk. I added 75 grams of whipped cream to make a diplomat cream (sans gelatine) but not enough to fill all the choux (only 5 large and 4 small choux). 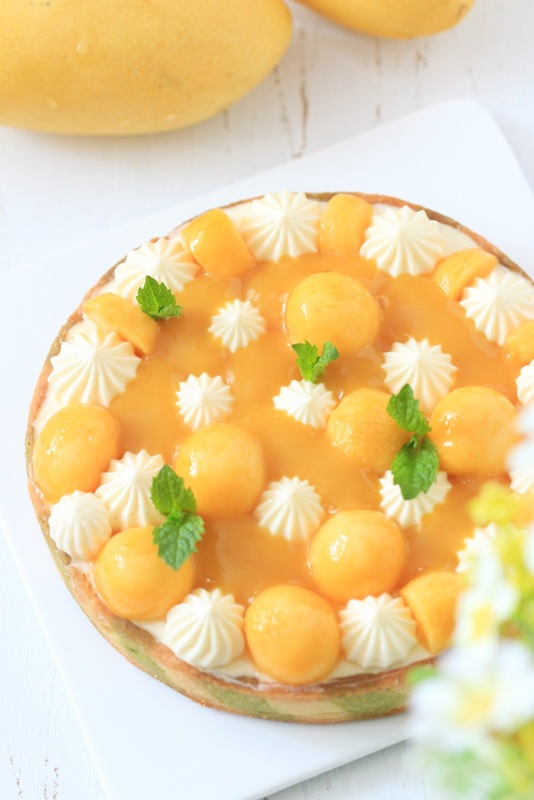 Diplomat cream is a lighter and delicious version of pastry cream, whipped cream is added to make a voluminous mixture that can be piped. I only assembled 3 religiuese as I need to do what I was supposed to be doing but you can make 8 pieces out the the choux recipe ( I can only fit several pieces of choux in one pan as you can see in the last photo). 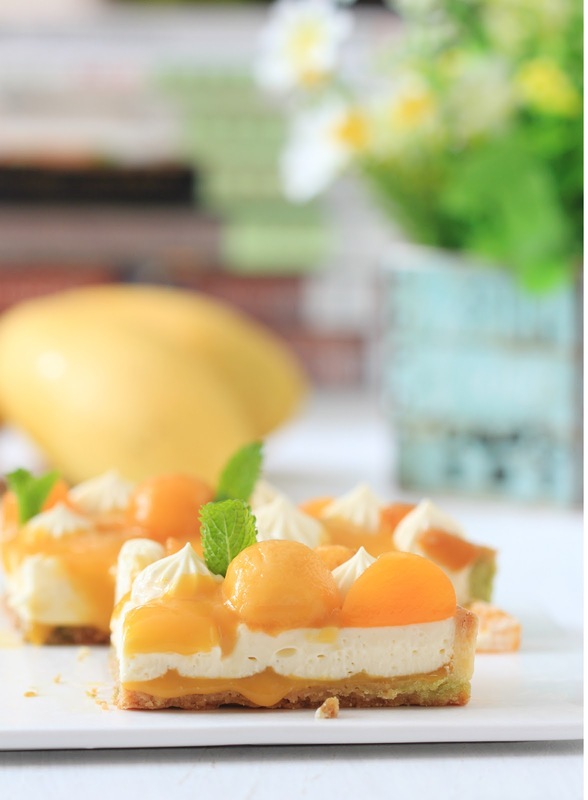 * In a mixing bowl or clean work surface, combine butter, sugar, cake flour and salt. 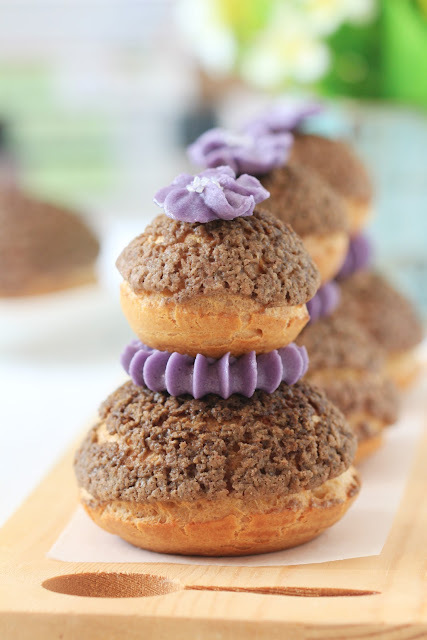 Rub ingredients together until it resembles a coarse bread crumbs, add in the ube paste. Gather the dough and knead gently, 4-6 times, until dough is smooth. Transfer into a plastic wrap and shape into a 5-inch square. Chill in the fridge for an hour or overnight. 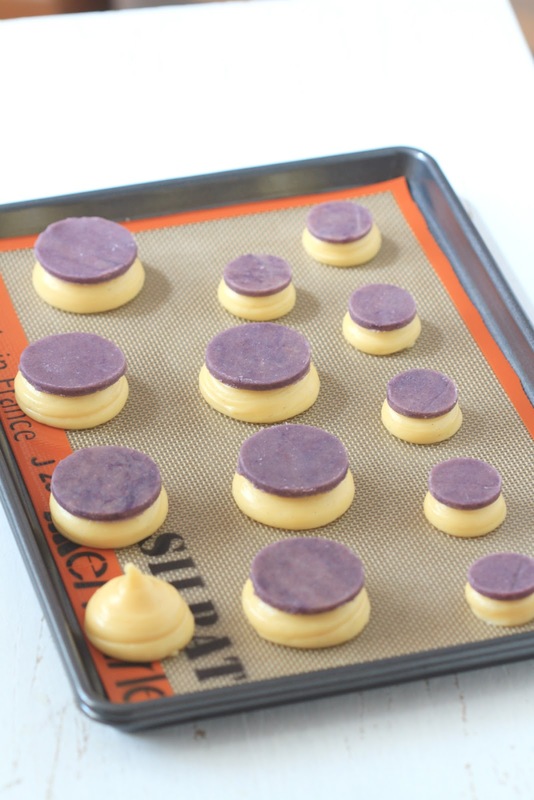 * Roll out dough into 3mm thick, using a 3-cm cutter for small choux and 4.5-cm for a bigger one, cut out 8 small ones and 8 big ones. 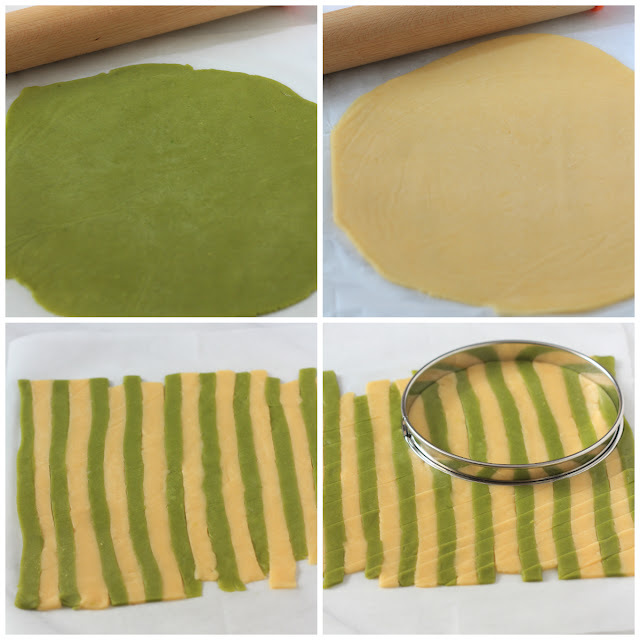 Re-roll the cookie dough, if necessary. * In a small saucepan, combine, milk, vanilla seeds half of the sugar and salt and bring to a boil. * In a small mixing bowl, whisk the yolk and the remaining sugar until creamy, add in the cornstarch and mix until smooth. 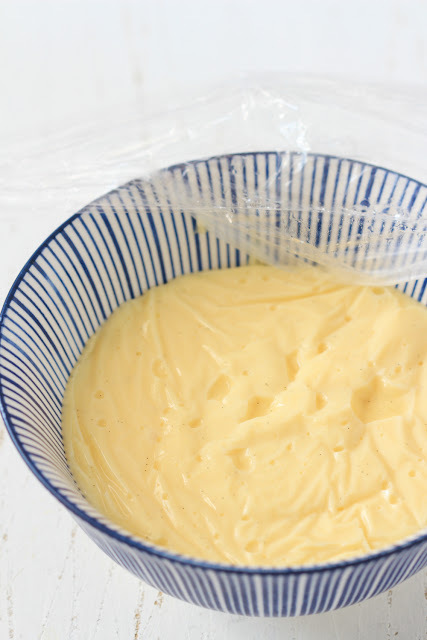 * Gradually pour in the warm milk into the yolk mixture, whisking as you pour to prevent curdling. Pour back mixture into the saucepan, and cook over medium heat while whisking constantly. Let mixture boil for a minute or 2. Remove pan from heat, add in the butter and the ube paste, and whisk until well combined. Transfer cream into a shallow container and cover with plastic wrap. Chill in the fridge until needed. 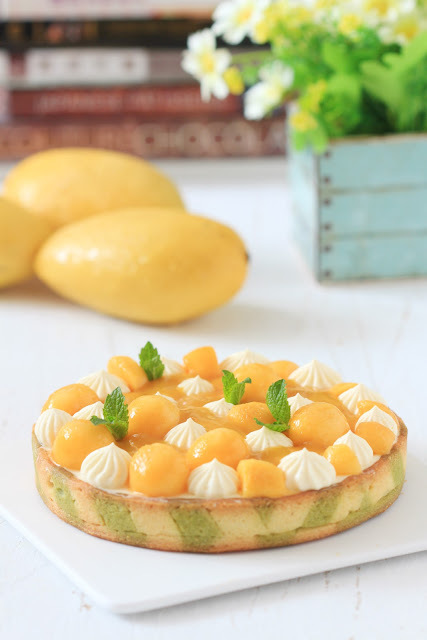 * Whisk the pastry cream until smooth before using. 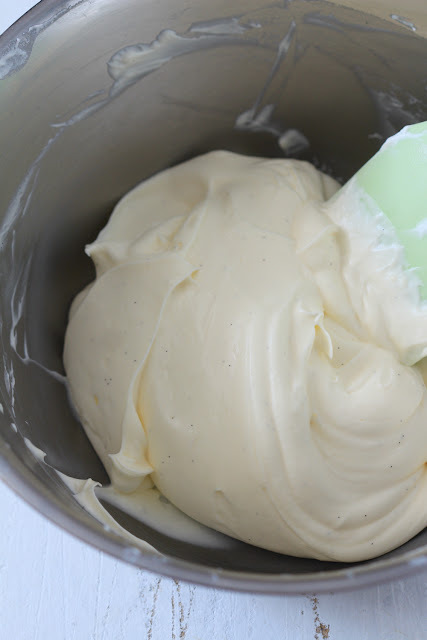 * In a small mixing bowl, combine ingredients above and beat until smooth. * Make 8 or more small flowers, using Wilton 102 tip. Chill in the fridge until needed. * You can make the flower decoration the day before and chill the remaining buttercream to use for the "collar" of religiuese. * Preheat oven to 200ºC. 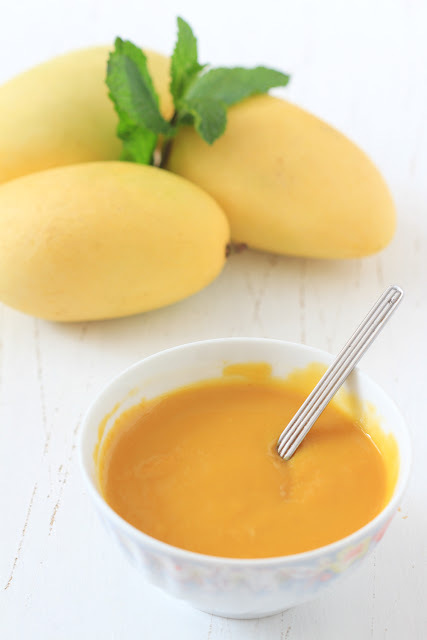 * In a small saucepan, combine milk, water , butter, sugar and salt; bring to the boil, stir until butter is melted. Take pan off heat, add the flour in one go and stir vigorously with a wooden spoon until dough forms into a ball. Put back pan on the stove and cook over medium heat for 1 minute to dry out the dough. * Transfer dough into a mixing bowl and beat over low speed to for 2 minutes or so to cool down a bit. * Add eggs in 3 additions, beating well after each, until dough is smooth and shiny. * Transfer dough into a piping bag with 1-cm round tip for the small one and 1.5-cm tip for the bigger one. You can use the 1-cm tip to pipe both choux, if desired. 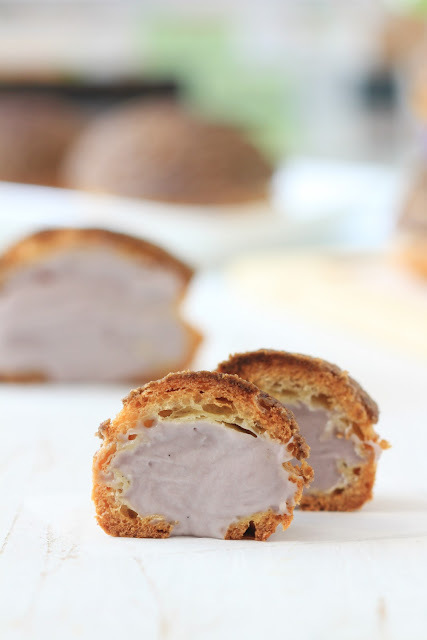 Top each choux with ube craquelin. 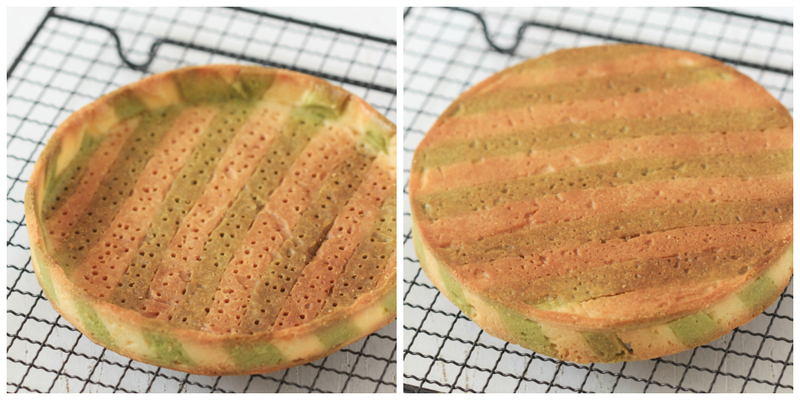 * Bake for 15 minutes at 200ºC then lower temperature to 180ºC and bake for another 20-25 minutes. * Take out the choux and turn oven off. Poke each choux with a pairing knife to release the steam. Place back into the oven and let it sit to dry out the inside of the pastry for 15 minutes. * Let cool completely before piping in the filling. 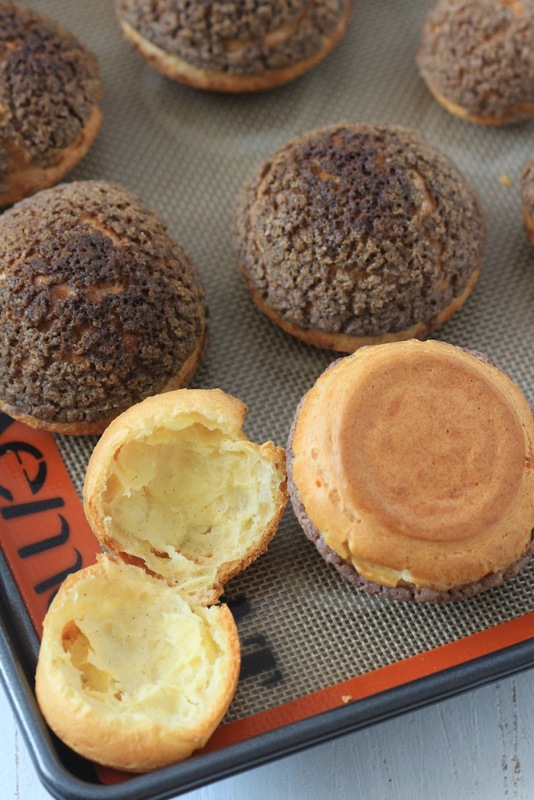 * Using a small round piping tip or a pairing knife, poke a hole at the bottom of each choux. 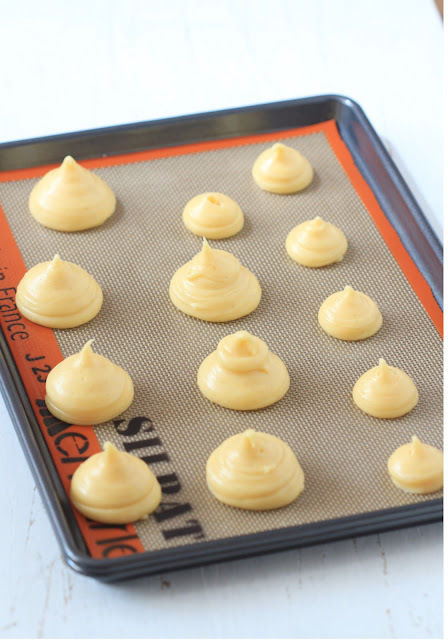 * Place the pastry cream in a piping bag fitted with a round tip and fill each choux. * Stir the softened buttercream until smooth and place into a piping bag fitted with a large French piping tip. 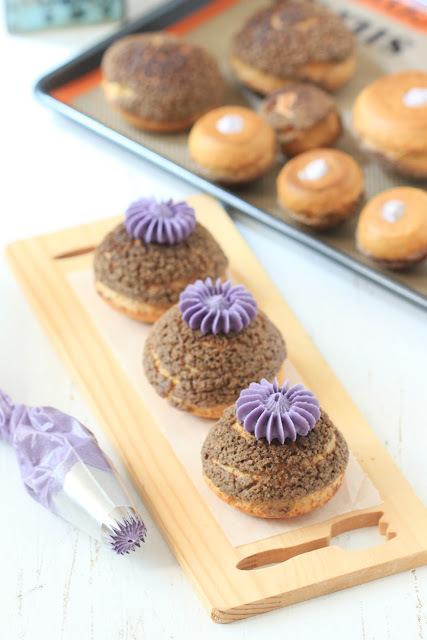 Pipe buttercream into each top of the bigger choux to create a "collar" or "ruffle", place the smaller choux onto the top, pressing down gently. Repeat until you make 8. 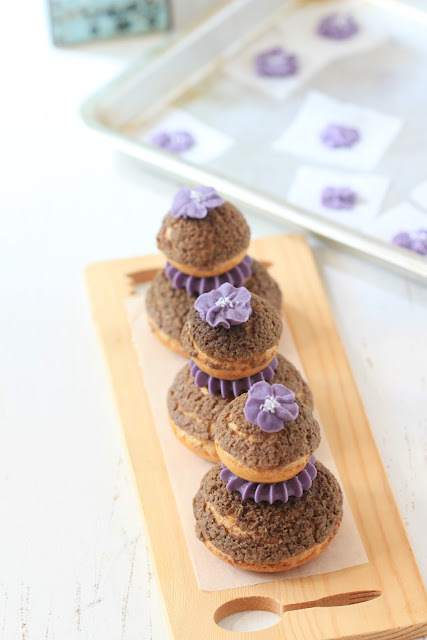 Smear a bit of buttercream on top of the choux and add in the buttercream flower decoration. * Chill in the fridge until ready to serve.